This article is about the franchise as a whole. For specific works of this name, see Alien vs. Predator (disambiguation). "AVP1" redirects here. For the ship, see USS Lapwing (AM-1). Alien vs. Predator (also known as Aliens versus Predator and AVP) is a science-fiction horror/action media franchise created by comic book writers Randy Stradley and Chris Warner. The series is a crossover between the Alien and Predator franchises, depicting the two species as being in conflict with one another. It began as a comic series in 1989, before being adapted into a video game series in the 1990s. Produced and distributed by 20th Century Fox, the film series began with Alien vs. Predator (2004), directed by Paul W. S. Anderson, and was followed by Aliens vs. Predator: Requiem (2007), directed by the Brothers Strause, and the development of a third film has been long rumoured. The series has led to numerous novels, comics, and video game spin-offs such as Aliens vs. Predator released in 2010 to generally positive reviews. The current logo of the franchise. The first Alien vs. Predator story was published by Dark Horse Comics in Dark Horse Presents #34–36 (November 1989 – February 1990). In November 1990, Predator 2 was released in theaters and included a scene depicting an Alien (Xenomorph) skull as one of the Predator's trophies. The first feature film was released in 2004, titled Alien vs. Predator, with the second film in the series, titled Aliens vs. Predator: Requiem, being released in 2007. Ellen Ripley does not appear in this franchise, as it takes place more than a century prior to the events of the Alien series. Lance Henriksen was the first to be cast in Alien vs. Predator, as Anderson wanted to keep continuity with the Alien series. The first actor to be cast for Alien vs. 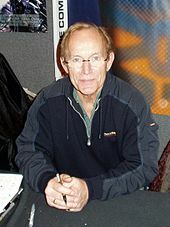 Predator was Lance Henriksen, who played the character Bishop in Aliens and Alien 3. Although the Alien films are set 150 years in the future, Anderson wanted to keep continuity with the series by including a familiar actor. Henriksen plays billionaire and self-taught-engineer Charles Bishop Weyland, a character that ties in with the Weyland-Yutani Corporation as the original founder and CEO of Weyland Industries (the company later taken over by Sir Peter Weyland in Prometheus in 2012 following Charles' death eight years earlier in 2004). According to Anderson, Weyland becomes known for the discovery of the pyramid, and as a result the Weyland-Yutani Corporation models the Bishop android in the Alien films after him; "when the Bishop android is created in 150 years time, it's created with the face of the creator. It's kind of like Microsoft building an android in 100 years time that has the face of Bill Gates." In the 2010 film Predators, when the group of main protagonists enters the Predators' camp, there is a brief view of an Alien skull on the ground (as well as the lower jaw of an Alien on the helmet of the Berserker Predator), referring to the similar moment from Predator 2 when an Alien skull is seen in the trophy room of the Predator spaceship. Furthermore, the 2018 film titled The Predator featured several references to AVP such as the shurikens, mask designs, and Lex's spear which Scar made out of an Alien tail. An alternate ending for The Predator displaying a Weyland-Yutani Corp pod containing Ripley and Newt (from Aliens) (both played by Breanna Watkins) wearing a Weyland-Yutani breathing apparatus shaped like an Alien Facehugger was also intended to further connect to the Alien films. In 2004, a Predator mothership arrives in Earth orbit to draw humans to an ancient Predator training ground on Bouvetøya, an island about one thousand miles north of Antarctica. A buried pyramid giving off a "heat bloom" attracts a group of explorers led by billionaire and self-taught engineer Charles Bishop Weyland (Lance Henriksen), the original founder and CEO of Weyland Industries, who unknowingly activates an Alien egg production line as a hibernating Alien Queen is awakened within the pyramid. Three Predators descend unto the planet and enters the structure, killing all humans in their way with the intention of hunting the newly formed Aliens, while the scattered explorers are captured alive by Aliens and implanted with embryos. Two Predators die in the ensuing battle with an Alien, while the third allies itself with the lone surviving human, Alexa "Lex" Woods (Sanaa Lathan), while making their way out of the pyramid as it is destroyed by the Predator's wrist bomb and eventually does battle with the escaped Alien Queen on the surface. The Queen is defeated by being dragged down by a water tower into the dark depths of the frozen sea, but not before she fatally wounds the last Predator. The orbiting Predator mothership uncloaks and the crew retrieves the fallen Predator. A Predator elder gives Lex a spear as a sign of respect, and then departs. Once in orbit it is revealed that an Alien Chestburster was present within the corpse, thus a Predalien hybrid is born. Set immediately after the events of the previous film, the Predalien hybrid aboard the Predator scout ship, having just separated from the mothership shown in the previous film, has grown to full adult size and sets about killing the Predators aboard the ship, causing it to crash in the small town of Gunnison, Colorado. The last surviving Predator activates a distress beacon containing a video recording of the Predalien, which is received by a veteran Predator on the Predator homeworld, who sets off towards Earth to "clean up" the infestation. When it arrives, the Predator tracks the Aliens into a section of the sewer below the town. He removes evidence of their presence as he moves along using a corrosive blue liquid and uses a laser net to try to contain the creatures, but the Aliens still manage to escape into the town above. The Predator fashions a plasma pistol from its remaining plasma caster and hunts Aliens all across town, accidentally cutting the power to the town in the process. During a confrontation with human survivors, the Predator loses its plasma pistol. The Predator then fights the Predalien singlehandedly, and the two mortally wound one another just as the US air force drops a tactical nuclear bomb on the town, incinerating both combatants along with the Predalien's warriors and hive, as well as the few remaining humans in the town. The salvaged plasma pistol is then taken to a Ms. Yutani of the Yutani Corporation, foreshadowing an advancement in technology leading to the future events of the Alien films. On October 28, 2010, io9 published an exclusive interview with the Brothers Strause in which they revealed that Alien vs. Predator 3 would have led directly into Alien. Greg Strause stated that, "The original ending for AVPR, that we pitched them, ended up on the Alien homeward [sic], and actually going from the Predator gun, that you see at the end, it was going to transition from that gun to a logo of a Weyland-Yutani spaceship that was heading to an alien planet. And then we were actually going to cut down to the surface [of the alien planet] and you were going to see a hunt going on. It was going to be a whole tribe of predators going against this creature that we called "King Alien." It's this huge giant winged alien thing. And that was going to be the lead-in, to show that the fact that the Predator gun [at the end of AVPR] is the impetus of all the technological advancements that allowed humans to travel in space. Which leads up to the Alien timeline." When asked about the ending sequence of Aliens vs. Predator: Requiem, that the Predator-weapon handed to Ms. Yutani would lead to us humans developing advanced space travel technology, Greg stated, "That was the idea. They never got any of the equipment from the first Predators. It's the first time they ever received any intact working technology left over. So they could take that and reverse engineer, figure out what the power source was – all of those things. And in theory, that would enable that company [Weyland-Yutani] to make massive advancements in technology and dominate the space industry. That was the whole idea, was to literally continue from Ms. Yutani getting the gun – and then cut to 50 years in the future, and there's spaceships now. We've made a quantum leap in space travel. That was going to set up the ending, which would then set up what AVP was going to be, which would take place 100 years in the future. That was kind of the plan." In 2012, What Culture stated that "surely sometime in the near future we will see a third attempt at an AVP movie" and listed five major reasons that would make a third sequel work – namely the inclusion of Colonial Marines, a strong lead character, no Predators teaming-up with humans, memorable action sequences, as well as a great director. In 2015, having worked on the special effects of Aliens vs. Predator: Requiem, VFX make-up artist David Woodruff (the son of Tom Woodruff who worked on both the Alien- and Terminator-franchises) participated in an interview with TheTerminatorFans, and when asked about the situation of a third chapter in the AVP-trilogy, he stated, "I haven’t heard anything about a 3rd installment, not even rumors. This Neill Blomkamp project is the first possibility I’ve seen or heard of another Alien film and I’m all about it. I know the guys at Amalgamated Dynamics are pushing for something like this too. It’s time." In 2015, during the London Film and Comic Con, Sigourney Weaver stated that she asked to have Ripley killed in Alien 3 because she knew that Fox were moving forward with Alien vs. Predator. Peter Briggs (writer of Alien vs. Predator) responded by praising all films in the franchise and pointing out that the AVP-films were more successful than Weaver's last two Alien-films, and noting that "There’s a terrific Alien vs. Predator movie still to be made by someone. It just hasn’t happened yet." In mid-2018, Shane Black, director of The Predator, tweeted his belief that a third Alien vs. Predator can still happen. A ComicBookRumours.com article from July suggested Fox may attempt an "AVP Cinematic Universe" after Ridley Scott finishes making the Alien prequels, after which Fox considered a "soft reboot" to the Alien series with new/original characters, a new setting, and new timeline, which the same article also suggested, if it were to happen, could potentially take place within the same continuity as the Predator films and AVP films, noting Predators featured an Alien skull cameo (along with other references to Aliens) Lex Wood’s Xenomorph tail spear from Alien vs. Predator makes an appearance in The Predator. An alternate ending for The Predator displaying a Weyland-Yutani Corp pod containing Ripley and Newt (both played by Breanna Watkins) wearing a Weyland-Yutani breathing apparatus shaped like an Alien Facehugger was also intended to further connect to the Alien films. There have been a number of spin-offs in other media including a large number of crossovers within the Aliens/Predator fictional universe. Dark Horse Comics published a line based on the franchise. Other books expanding this fictional universe has been released through the years, and also such that depict the background to the films, including works by special effects company Amalgamated Dynamics Incorporated (ADI) which has worked with both the Alien, Predator, and Alien vs. Predator films. An Alien vs. Predator arcade beat 'em up game was released by Capcom in 1994. Two other Alien vs Predator games were also published by Activision for the SNES and Game Boy in 1993. There were also several Alien vs. Predator mobile games, and two cancelled titles for the Atari Lynx and Game Boy Advance. In 1994, Atari Corporation released the Rebellion Developments-developed first-person shooter Alien vs Predator for the Atari Jaguar, in which one could play as a Marine, Predator or Alien. Rebellion then went on to develop the similarly themed 1999's Aliens versus Predator for the PC. This was followed by, among others, Aliens versus Predator 2 and the expansion pack Aliens versus Predator 2: Primal Hunt. In 2010, Sega released a reboot, Aliens vs. Predator, a multiplatform first-person shooter also made by Rebellion and tied into the timeline of the live-action films. Both Alien and Predator appear as downloadable characters in Mortal Kombat X (2015). AVP: The Hunt Begins (2015) - In 2013, Prodos obtained the license from 20th Century Fox to do a boardgame and successfully funded it on Kickstarter. In 1994, Kenner released a collection of action figures known as Aliens vs. Predator. This followed the two initial series of Aliens that were based on an animated series, Operation: Aliens, that was never broadcast. As such, the inclusion of Predator is often considered the 3rd and 4th series of the Aliens line. This collection includes several Aliens, many of which feature built-in attack features, and Predators, which include removable masks and battle weapons such as spears and missile launchers. The figures generally possess 5 points of articulation, and some include a mini Dark Horse comic book. "The stage is set for the universe's two most ferocious enemies. It's the gruesome and evil Aliens against the big-game hunter Predator. Who will win... the beast or the hunter? Can the Predator stop the evil Aliens before the galaxy is destroyed?!?!?!" The Aliens: Hive Wars series was released in 1995, which included various Aliens, Predators, and larger scaled space marines. More figures, including a female Predator and an Alien/Predator/Smash Mason 3-pack, were designed for this series but never released as part of the line. Six sets of Aliens and Predator Micro Machines were also planned by Galoob in 1995 but never released. This would have also included the LV-426/Outer World Station Action Fleet Playset. Thanks in part to the research of toy collectors, many photos of these unreleased toys and prototypes have shown up on the Web in recent years. In December 2002, McFarlane Toys released a highly detailed Alien vs. Predator deluxe set. In 2004, they produced a series of figures based on the Alien vs. Predator film. Alongside the articulated figures, McFarlane also released statuesque display sets depicting scenes from the film. Hot Toys produced highly detailed 16" tall figures for every film including Aliens vs. Predator: Requiem in 2007. That same year, NECA released two series of Requiem figures. On August 4, 2014, Universal Studios confirmed that there will be haunted mazes based on Alien vs. Predator for their Halloween Horror Nights events at both Universal Studios Hollywood and Universal Studios Florida. Wikimedia Commons has media related to Alien and Predator. ^ Horn, Steven. "Interview with AvP Director Paul Anderson". IGN. Retrieved 15 January 2008. ^ Giles, Jeff (March 11, 2008). "Fox Brewing Alien vs. Predator 3?" RottenTomatoes.com. Flixster, Inc. Retrieved April 23, 2016. ^ Woerner, Meredith (October 28, 2010). "The Third Aliens Vs. Predator Movie Would Have Served as a Prequel to Alien." io9.Gizmodo.com. Gawker Media. Retrieved April 23, 2016. ^ Markham, John (December 17, 2012). "5 Things Needed to Make a Good Alien Vs. Predator Movie." Archived November 2, 2015, at the Wayback Machine WhatCulture.com. What Culture Ltd. Retrieved April 23, 2016. ^ "David Woodruff talks Alien 5, bringing back Hicks and AvP 3 movie rumors!". aliensversuspredator.net. Retrieved 8 May 2016. ^ "Sigourney Weaver Blames Alien Vs. Predator For Basically Ruining The Franchise". cinemablend.com. Retrieved 8 May 2016. ^ "'Alien vs Predator' Writer Responds to Sigourney Weaver". Bloody Disgusting!. Retrieved 8 May 2016. ^ "Fox Reportedly "Reassessing" Future of the 'Alien' Franchise in Wake of 'Alien: Covenant'". 21 July 2017. ^ Ryan Leger (30 July 2018). "The Future of Alien and/versus Predator". ComicBookRumors.com. ^ a b c d "Alien Vs. Predator (2004)". Box Office Mojo. Retrieved 2016-12-29. ^ a b c "Aliens Vs. Predator - Requiem (2007)". Box Office Mojo. 2008-03-23. Retrieved 2016-12-29. ^ "AVP: Alien vs. Predator Reviews". Metacritic. Retrieved 2016-12-29. ^ a b "CinemaScore". cinemascore.com. ^ "AVPR: Aliens vs Predator - Requiem Reviews". Metacritic. Retrieved 2016-12-29. ^ "25th annual Razzie awards — Worst remake or sequel". Golden Raspberry Awards. Retrieved January 13, 2008. ^ "MTV Awards 2008 — Best Fight". MTV. Retrieved June 13, 2008. ^ "Golden Raspberry Award Foundation". Golden Raspberry Awards. Archived from the original on April 14, 2010. Retrieved August 23, 2009. ^ "The Ultimate Alien and Predator Collection " – via Amazon.com. ^ "AVP: Alien vs. Predator / Aliens vs. Predator - Requiem" – via Amazon.com. ^ "AvP 1 & 2 Double Pack" – via Amazon.com. ^ "Alien Vs Predator: Total Destruction Collection" – via Amazon.com. ^ "Avp Total Destruc Coll Sac" – via Amazon.com. ^ "Predator 4-Movie Collection - 4K Ultra HD Blu-ray Ultra HD Review | High Def Digest". ultrahd.highdefdigest.com. Retrieved 2018-11-14. ^ "Alien vs. Predator/ Alien vs. Predator: Requiem Double Pack " – via Amazon.com. ^ "SEGA and Twentieth Century Fox Licensing & Merchangising Announce New Aliens vs. Predator Game". SEGA. 2009-02-11. Archived from the original on 2013-02-02. Retrieved 2009-02-12. ^ "Alien vs Predator: The Hunt Begins | Board Game". BoardGameGeek.com. Retrieved 2016-08-03. ^ Duke Nostalgia's Predators Page Archived February 14, 2008, at the Wayback Machine DukeNostalgia.com. Retrieved February 9, 2008. ^ Classic Aliens vs Predator Nostalgia Archived February 14, 2008, at the Wayback Machine ForumPlanet.GameSpy.com (January 5, 2008). Retrieved February 9, 2008. ^ Cawiezel, Marc H. The History of Unproduced Alien and Predator Toys Members.AOL.com (October 29, 2006). Retrieved February 9, 2008. ^ Crawford, Michael Alien vs. Predator MWCToys.com (December 13, 2002). Retrieved February 9, 2008. ^ Alien Attacks Predator CollectionDX.com (January 12, 2008). Retrieved February 9, 2008. "When Titans Collide, Can We Survive?" (JPG). Thumbnails-visually.netdna-ssl.com. Retrieved 2016-12-29. "Aliens vs. 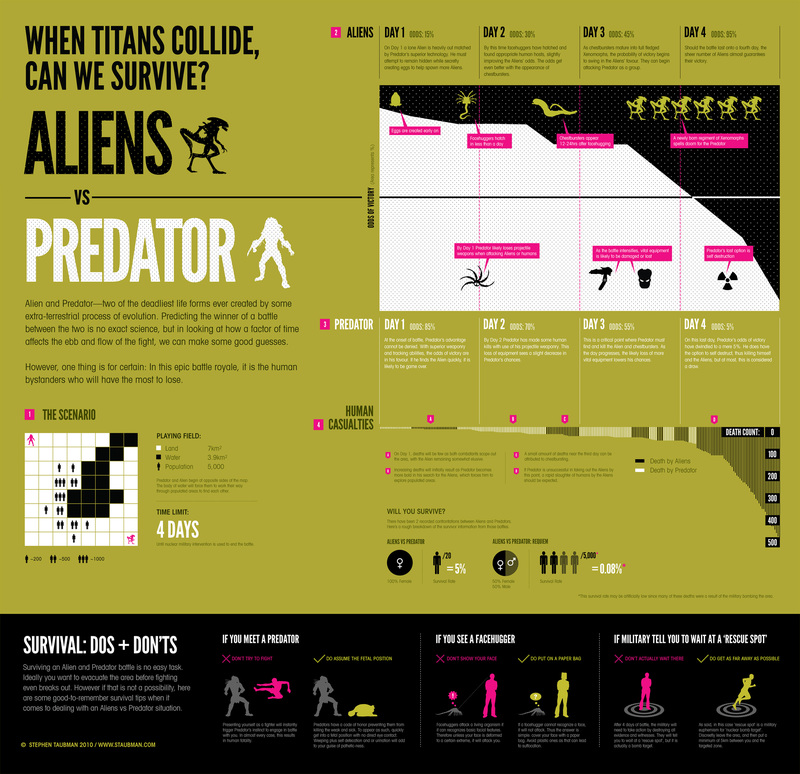 Predator [Infographic] ~ The Geek Twins". Thegeektwins.com. 2012-03-05. Retrieved 2016-12-29.